Барааны дугаар 9780521140706. Categories: CAMBRIDGE, Skills. 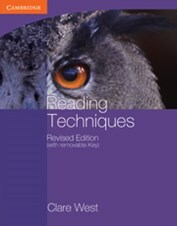 Reading Techniques is for students at upper-intermediare level who wish to improve their general reading skills in English and/or to work towards international examinations at B2 level (common European Framework). The emphasis in Reading Techniques is on learning practical techniques to enable students to become effective readers, and to tackle reading papers in examinations with confidence. It can be used to supplement any coursebook at this level and is suitable for classroom use, for homework or for self-study.